Poznań is one of the oldest, greatest and most dynamic cities in Poland. Numerous historic buildings and tourist attractions illustrate the wealth of the thousand year tradition of the city. Due to historical evidence it is known that the fortified settlement of Poznań was one of the greatest and most important centres of government, commercial and religious activity during the beginning of the Polish state. Here on the island in the River Warta, Prince Mieszko I built his palace and the fortified settlement with the first cathedral in Poland, where he was buried, as were his son and another six of the first rulers of Poland. Even though Poznań lost its political dominance, it has always been an important commercial and cultural centre. Today Poznań is the fifth largest city in Poland with a population of half a million and simultaneously is the centre of a conurbation of over a million inhabitants. In addition to the permanent residents, 130,000 students study in Poznań. They come to Poznań not only from all over Poland, but also from abroad. They choose Poznań because of its prestigious universities and also because of the ease of finding well paid work in Poznań. While thinking about statistics – for decades Poznań has taken pride in having the lowest unemployment in Poland, with the average salary being higher than the national average and also its image of a commercial and business centre. Besides the nationally famous Poznań International Fairs, central and head offices of many firms and factories with international capital are located in Poznań, including Glaxo Smith Kline, Volkswagen and Bridgestone and also Polish names such as Allegro, Apart or Lech. 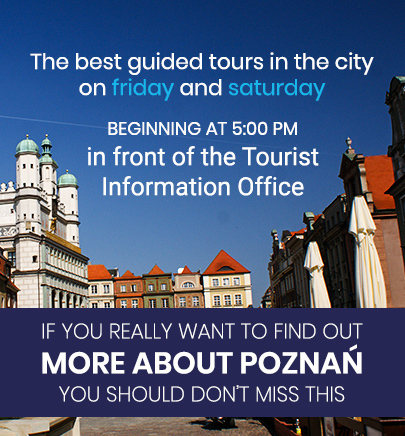 If you wish to find out more about the city’s past look at the history folder to discover the Poznań of the XXI century it is essential to read Poznań today, and if you have recently come to Poznań look at: Poznanian historic buildings and sites and also practical information!